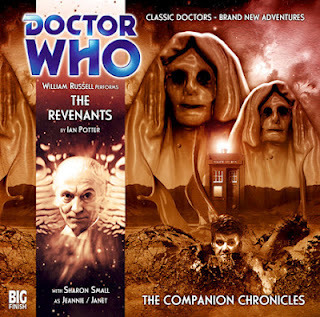 Given away as a free download (if you get the secret code from DWM #448) The Revenants is a Companion Chronicle featuring William Russell as Ian Chesterton and therefore technically a First Doctor story (I have yet to listen to it so may be completely wrong!). This was written by Ian Potter (blog here) and the cover is by Nick Giles. Given it was free maybe expectations should be set appropriately – or maybe not. Enough speculation, time to listen and then let you know what I thought! Mainly set shortly after Dalek Invasion of Earth (see review here) this begins with Ian on a ferry to the Orkney Islands prompted to recall when he visited the islands (and much is made of Orkney/ Orkneys/ the Orkney Islands). It turns out that after locking Susan out of the TARDIS the Doctor claimed to have returned Ian and Barbara back to Earth in their own time. No sooner have they left the TARDIS to explore than the ship vanishes leaving them apparently abandoned as was Susan. Exploring the find themselves trapped in a marshy bog fighting for their lives before they are rescued by Janet the local witch (or spey wife in the local vernacular)! It turns out they are on Hoy in the late 1950s which is (amongst other things) home to both the Navy and two armies of Vikings cursed to fight until Ragnarok comes round. The net result is that the marsh is full of the drow (local name for the undead) or revenants as they are more properly called. Narrowly escaping the clutches of the Revenenants Ian and Barbara are taken to a cottage where they find the Doctor who has been waiting for some years, the TARDIS having slipped back in time. Whilst debating the way forward the cottage gets attacked by the mud-based drow, slowly gaining ground before Ian by chance throws whiskey on one of the attackers before setting fire to it – fire being a known protection against the supernatural. After some debate on cause and effect they decide to capture a sample of the drow. Having done this the Doctor contrives a plan to destroy them but Janet interferes and saves the day with compassion rather than violence. The story ends (apart from a coda) with Ian and Barbara debating staying in the 1950s and waiting for 1963 to come round again but deciding to stay with the Doctor as he is still getting over losing Susan. This is my only complaint – they have just noted that the Doctor has had years waiting for them (and there is a hint of very many years) so why would the separation be fresh for him just because it is for them? Update 14 June 2012 – Ian Potter (the author) covers this point on his blog see here, as I commented I am still not fully convinced but so what?! William Russell is wonderful reprising Ian, accompanied by Sharon Small as Janet (and her niece – all CCs tend to be two-handers) who is tremendous and convincingly Scots. I strongly suggest Big Finish sign her up as a companion – she is wonderful. The soundscape and music are fine as well. Let’s face it , Big Finish struggle to turn out anything except quality and this is no exception. For free this is amazing! What did you think?